The 5087B wideband distribution amplifier is an economical solution for distributing signals from various frequency standards such as Cesium, Rubidium, Quartz or GPS receivers. The 5087B is a perfect solution for standards laboratories that need simultaneous calibration of multiple test equipment. For manufacturers or R&D labs, the 5087B with its 12 channel wideband sine wave distribution can connect all test equipment in a rack to the same frequency source. And if you need to distribute frequency standards from the calibration lab to the manufacturing or R&D facility, the high output-to-output isolation and output-to-input isolation keeps the effects of accidents from propagating to other channels or upstream to the frequency standard. Front panel lights allow you to check status of the amplifier at a glance. Indicators are provided for power, alarm, input, and all 12 outputs. 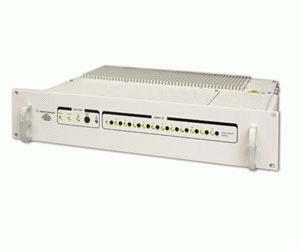 An alarm occurs whenever there is loss of input signal, or loss of any of the 12 outputs. Full remote control and monitoring of the amplifier can be done through the Ethernet port, including checking status and alarm conditions.